Everything is so full of promise! My plants are just bursting to get out of the ground and start producing! And some things happen quick! I got my first Pluot from my Pluot tree. I had no idea that they were ready this early in the season. I’ve also started picking my Anaheim chili peppers and am enjoying them in lots of different foods. I am picking the Poblano peppers, even if they are still not quite ripe. They’re quite sweet, almost like Bell Pepper at this stage. Both are from my South garden. The peppers in the North garden are not even producing at this point. I think this is because it only gets half-day sunlight. The planters are going pretty well. The front planter has already given us baby spinach, which is very delicious. The rear planter seems to be starting well, but for some reason the plants in it have stunted a little bit, and are slowing down. This concerns me, and I’m investigating possible pests. 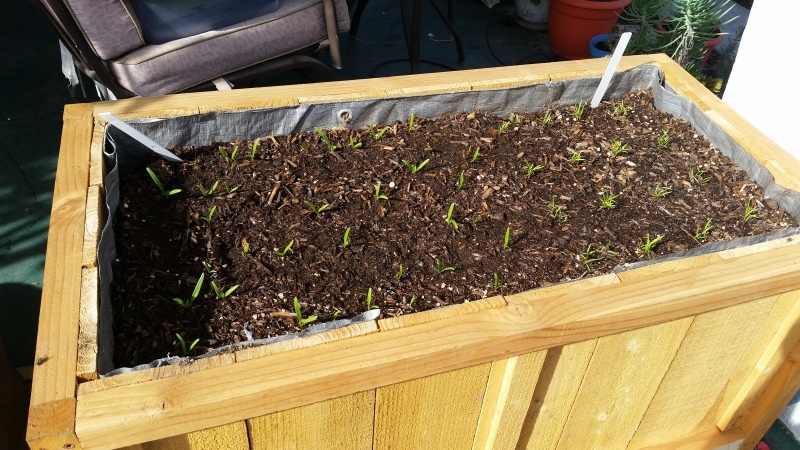 I’ve also added redworms to the rear planter to see if I can learn anything from that. 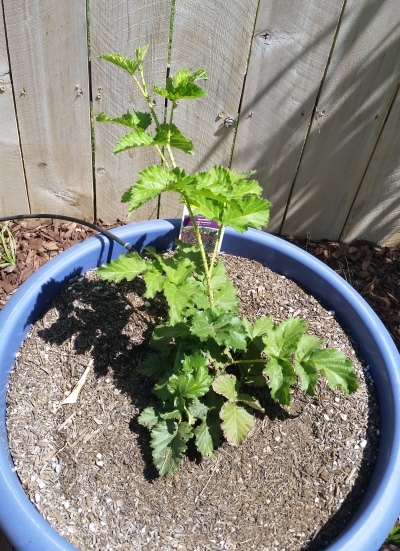 The blackberry planter is going quite well. There’s really only one or two blackberry canes, but they are very leafed out. 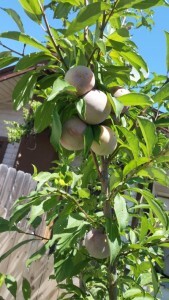 And the backyard fruit grove is very interesting. I’m getting some blueberries already. 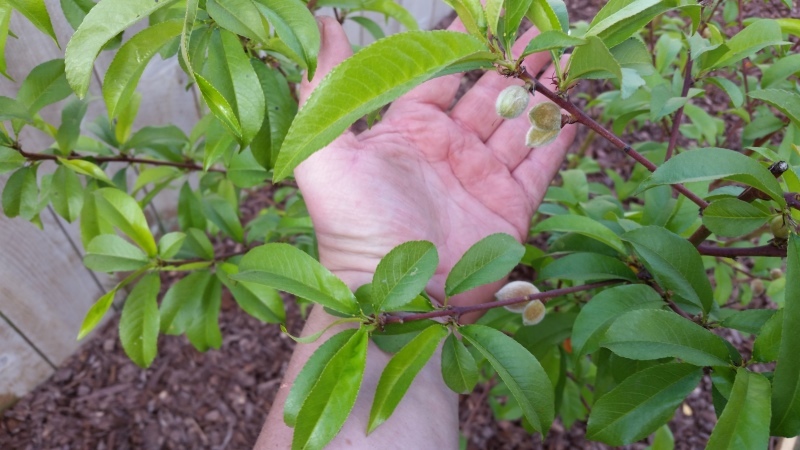 The oranges are doing well, but the cherry tree seems to be yellowing a little. I’m having a hard time figuring out why this is. I’ve purchased a soil testing kit, and a moisture monitor, and will start testing various sites around my garden to figure it out. The front yard orange tree is doing quite well. The oranges right now should be called “greens”. They are small and hard, but there are quite a lot of them. The blackberry is in the image with the single blue pot. 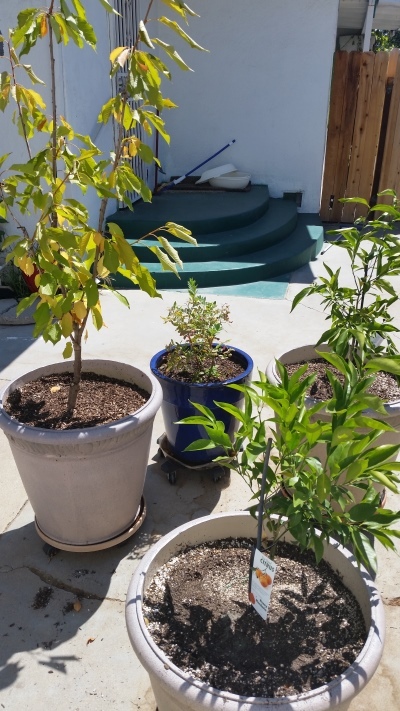 My “potted orchard” is in multiple pots. So with all this gardening that I’ve been doing, and upgrading the woodshop, where am I in Aquaponics? Well, the bluegill are still living in their aquarium. But I don’t have a completed fish shed, or much of a start on the greenhouse. And the Fresno heat is coming, so it is going to be difficult to work in the blistering summer. So I’m going to wait until late October to break ground on the aquaponics system. When the heat has died off, and I can work without melting into a puddle. That’s also another reason why I want my aquaponics system indoors, in order to control the climate. I figure if I use a swamp cooler and solar panels to run it, I can keep summer temperatures in the mid-80’s, instead of the low hundreds! When temperatures get that high, plants start wilting, fish start succumbing to disease, and weeds get seriously out of control. Ah. Control. That’s another thing… how am I going to control everything? Sometimes I really wish I had a swimming pool I could convert into an aquaponics system. Think of all that thermal inertia! What I really need in my case is a system that watches water levels and quality, switches the filling and emptying of the grow beds, and keeps the inside temperatures level. Near freezing temperatures in the winter are a problem, as are boiling hot summer days. I also want updates that I can read on WIFI from a tablet or iPad, and SMS alerts to my cell phone for emergencies. So for the last several months, I’ve been experimenting with Raspberry PI, Arduino, FPGAs, and with irrigation valves, to see if I can build a system that does what I want. But it just wasn’t right… I kept running into problems with input / output and the limits of the electronics that need to be connected to an array of relays to make it all work. I see where people in the Maker Culture have made their platforms do things in similar ways, but only after adding relay shields and other things. It finally occurred to me that a solution already exists in factories and manufacturing plants. Instead of an Arduino connected to a bunch of relays, and hardened for a damp environment, I should instead use a programmable logic controller (PLC) that already has this functionality built in. So I’ve been looking at various PLCs to work with. Allen Bradley is the one primarily used in the USA, and Siemens PLCs are used in Europe. However, I like and trust Siemens… so I’m not sure what I’ll choose as yet. I’ve also downloaded a PLC simulator, and have been refreshing my knowledge of ladder logic – which is pretty old and rusty. I’ve also started creating a system schematic of how it is all supposed to work together. At this point, I’m thinking of using the Raspberry Pi to interface the PLC to a generated web page on my home network that I can use to update the system through my iPad. I’m still studying how to work that out. But I have the summer to get it all figured out, because I’m breaking ground for the rest of the project in October, and I hope to have it finished by May of 2016! 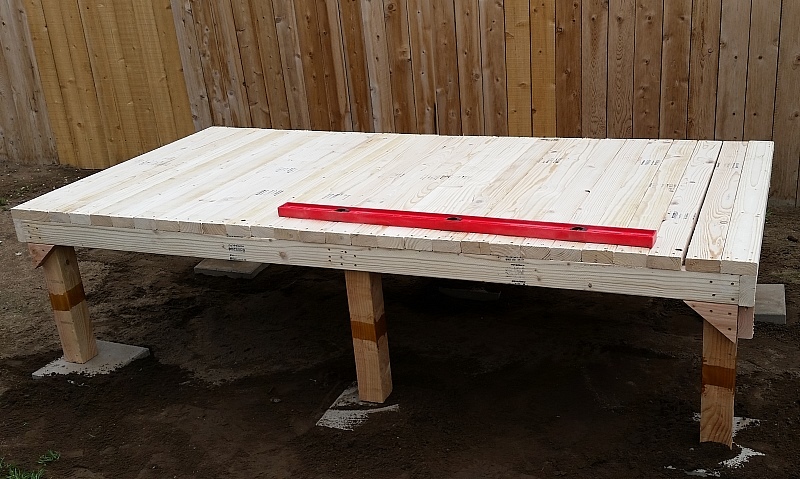 I’ve been using my 12 inch miter saw clamped to a bench, and using a 2×4 clamped to that same bench as a part support. It worked, but it really sucked. I needed it all squared away. I also had a second problem in that I don’t have a lot of shop storage. So I decided to hit two birds with one stone, and create a great miter bench with built-in storage. ou are not going to get tolerances in the thousandths. It doesn’t offer physics that let you rotate parts together to see how they work. But for woodworking, or even designing a greenhouse, this program rocks! If you want to learn more, check out the Sketchup website. 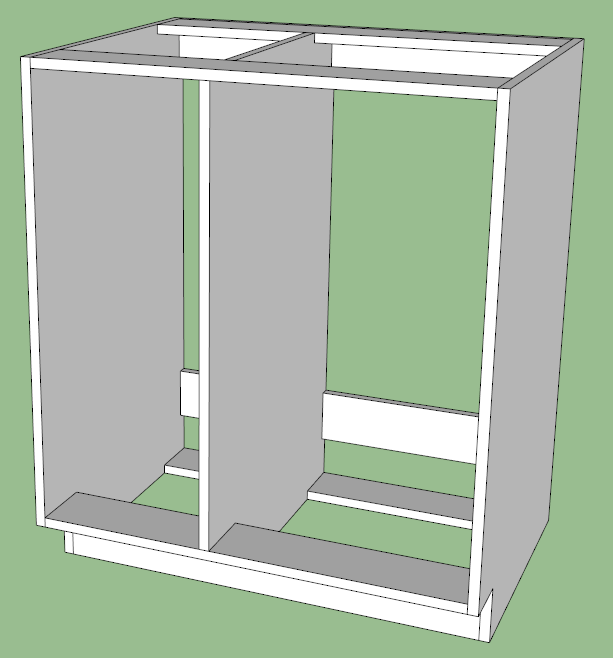 I built the cabinets out of 3/4 inch cabinet quality fir plywood, for about $28 per 4×8 sheet. I think I used 3 sheets because I built four of these! Here is what the finished project looks like. 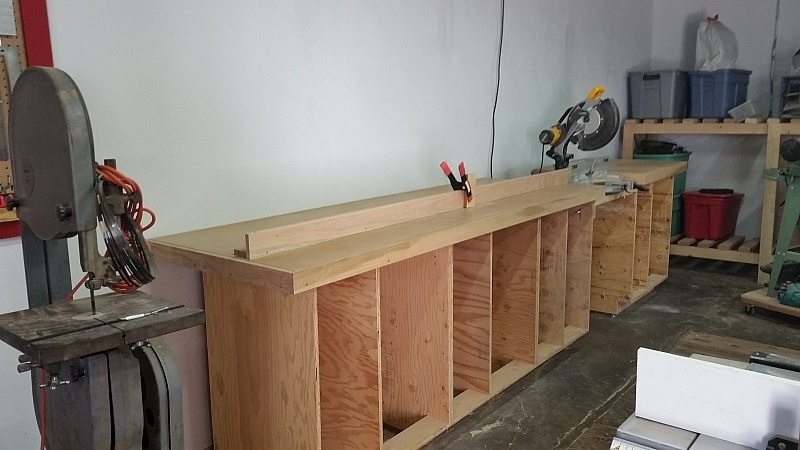 The whole thing is about 14 feet long, with the miter saw installed between the cabinets. If you click on the image, it will take you to an album where you can see my progress in building the whole thing. As you can see, I don’t have shelves, or doors, or drawers installed in the bench as yet. I really do need these because I have few places to actually store things in my woodshop. Right now I’m experimenting with different ways of making and installing drawers, and figuring out how I want my layout to be. Also, I’m trying to decide if I want to paint, stain, or otherwise protect these cabinets. I’ll want to do that before I add drawers or doors. I do not plan to add any facing to the cabinets. I’m fine with the way they are. Cabinet doors will use European hinges, and so will hide the plywood edging. 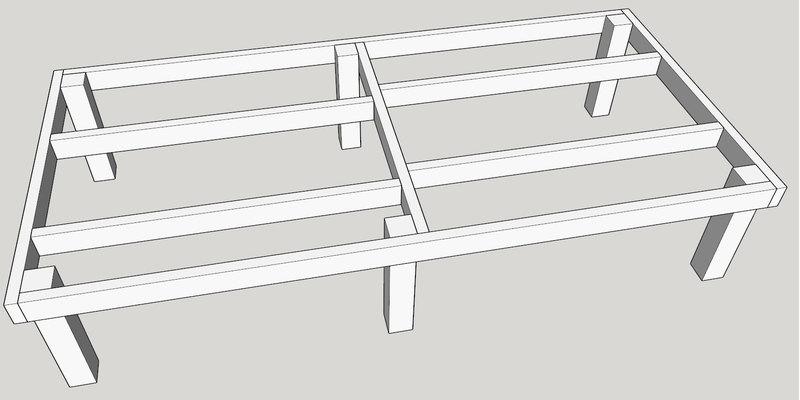 Drawers could also have facing that extends over the plywood edging. I plan to use engineered wood for the doors and drawer fronts to avoid wood movement. So, when you have a working mitersaw bench, what is the first thing you build using it? 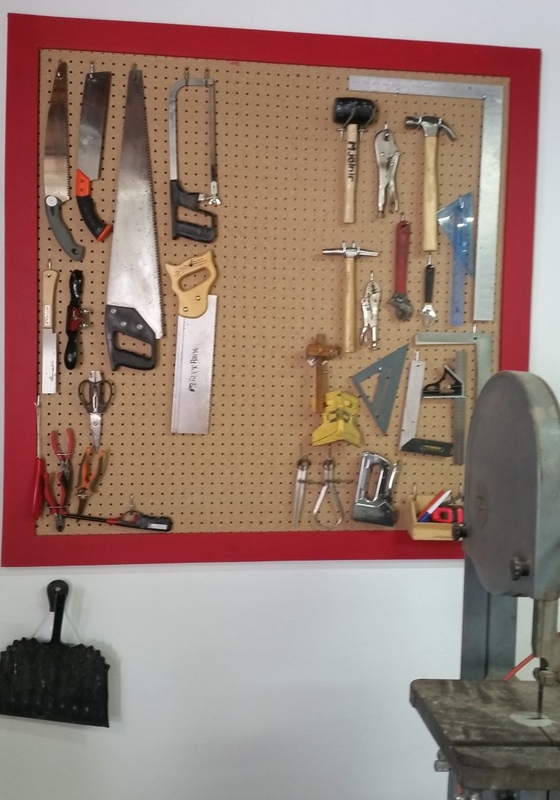 I built a tool pegboard. I’ve been needing one, because I have tools that are too unwieldy, or too unhandy to just drop into a toolbox. My last woodshop had a 2 x 4 foot tool pegboard, and that was just a little too small. This shop needed something bigger – so I chose a 4×4 foot pegboard. I haven’t filled this pegboard with tools as yet. I’ve put all the tools that I commonly use on it, and I’m waiting to see what else I’ll put on it. As I turn to a tool more often, it is likely to win a place on the board. Oh! Something else I’ve found out. I’ve had problems in the past with the metal pegs coming out of the pegboard when I pick up a tool. The pegs you get from the big box stores are somewhat loose in the pegboard, and wiggle or come out. In the past, I’ve tried to fasten these down in various ways. I don’t want a permanent method of fastening down a metal peg, so instead I use hot melt glue. It’s easy to run a glue gun into the holes, and add a peg. Another dab or two of glue, and the peg stays put. If I want to move the peg around, I can heat up the glue and remove it, then pull the glue off the pegboard. Also in this image is my Porter Cable bandsaw that I picked up used from Craigslist for about $200. My shop is shaping up. But it is still messy, and I still have a way to go. Experimental failure…and maybe some success? So as part of the setup of the South Garden, I tried an experiment of digging the garden out to a depth of almost 3 feet, and sifting all that dirt to remove the Bermuda Grass that infests that area. Bermuda grass is tough. It leaves roots that go deep, and it can spring up anew from its roots. My goal was to remove all of that. Also, sifting that soil allowed me to get rid of pest grubs that would happily eat my garden. Somehow, I had this fantasy that I was removing weeds too. So, here’s the deal. Sifting through soil won’t remove weeds, or tiny weed seeds. Maybe hard radiation would get rid of them. BUT, it did dramatically reduce Bermuda Grass. I’ve had very little of that. 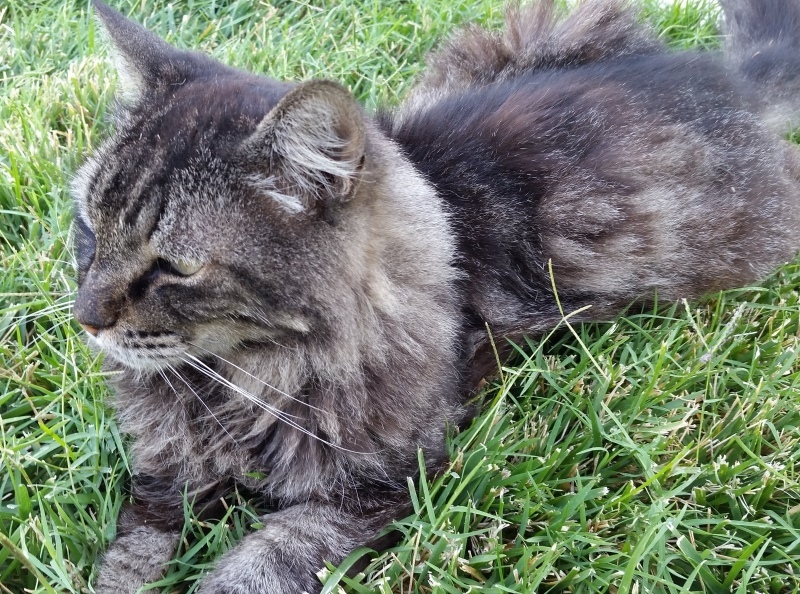 I do however, have crabgrass. But that’s much easier to remove. I hate weeding. That’s another reason why I’d like to go completely Aquaponics, indoor, with a non-soil substrate. During planting I got the South Garden and the North garden set up for automatic drip watering. I planted peppers throughout the South and North gardens, then planted onions, potatoes, carrots and spinach on the South Garden porch. And I continued to train the grape vine across the porch in the South Garden area. In the top image you can see the beginnings of the potatoes! They’re off to a great start. Next are my two half-barrels of onions. They are also off to a good start. They don’t seem to be crowded, and they seem to like the conditions. I hope the barrels work out! The barrels and the potato bags all sit on planks that are raised from the concrete porch on bricks. The thought was that I could prevent damage to the painted concrete porch by allowing better airflow under it, and I could prevent overheating to the bags and barrels when the concrete of the porch heats up in the sun. 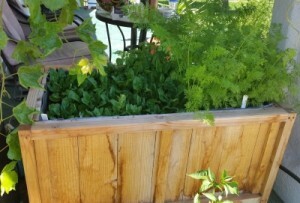 Following that is my raised bed planter that I’m using for carrots and spinach. The idea here is to have a continuous harvest of spinach during the summer. Fresh salads, sandwich filler – yum! They are all sprouting very well. I’ve planted the peppers in the South Garden. Mostly Anaheim peppers, because they are tasty, but I have Cayenne and New Mexico in there too. I’ve tried to offset them so they all get enough light. Now it is all about weeding. In the backyard, I’ve tried planting peppers, squash, beans, melons and zucchini in the raised bed planters. 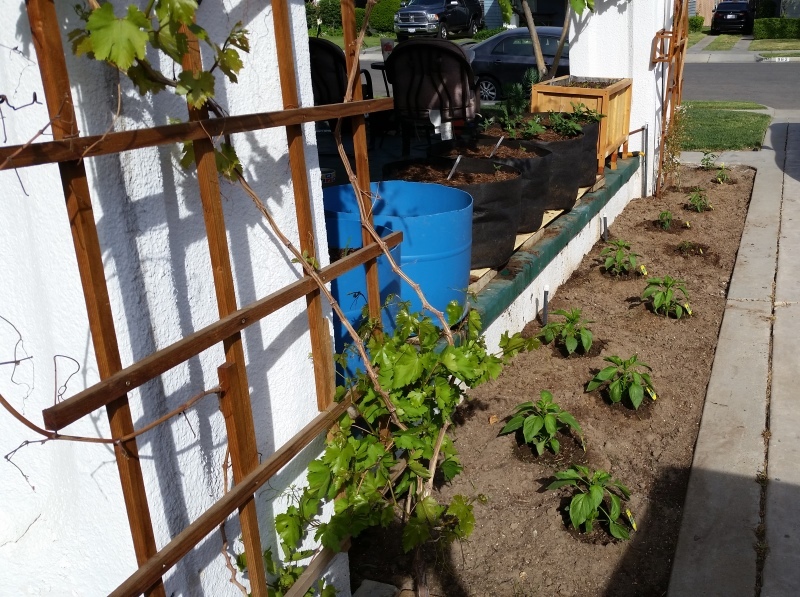 The idea is that the beans, squash and other climbers are planted against the trellis, and the peppers are planted out on their own. I have quite a few different peppers here, including Habenero and yellow banana. 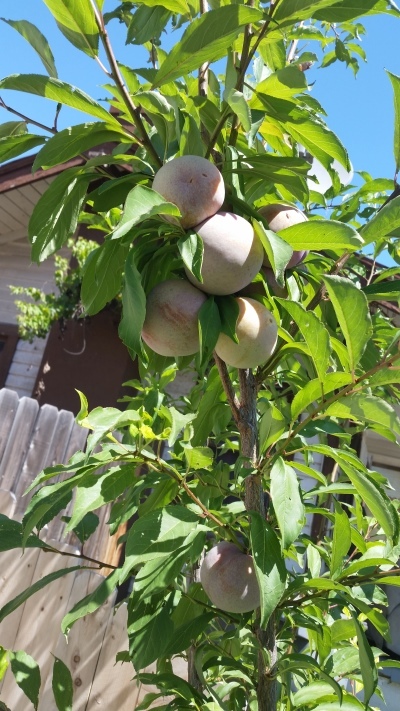 And finally, the fruit trees are doing quite well. I’ve added two Honeydew Tangerine trees in post in the back yard, along with a blueberry bush, and a cherry tree. 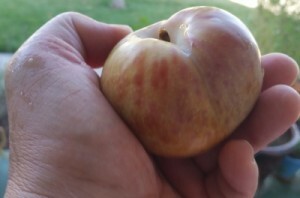 The trees in the North Garden are already producing fruit. 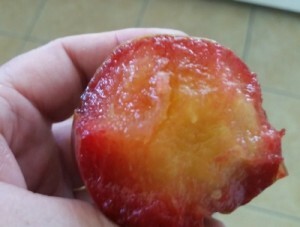 You can see the little Nectarines here. They seem to be really liking life, and I’m going to have to prune them back this fall to keep them from over running the yard. So far, so good. But as the weather gets hotter, and the plants start competing with each other, and the bugs discover everything, it is going to get a little more difficult. Here’s hoping all goes well! 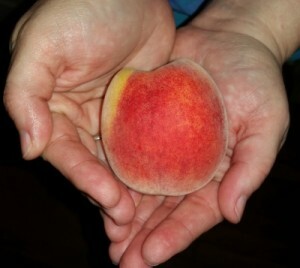 This year we tried to grow our own produce from seeds. I set up a light bar on a timer in our spare bedroom, along with a heating mat. We planted lots of different types of seeds. We planted just after Christmas. By early March, our results looked like this. And then we tried to transplant them outside. That sentence has just made experienced gardeners wince. The results were a disaster. The new plants flopped around during the planting, and by the next day they had all turned white and wilted. It was a total loss. Here’s what I should have known. When growing seedlings in greenhouse conditions, it is necessary to use a fan to circulate air around them. It doesn’t have to be a heavy wind, but it does need to be enough to cause the plants to move a little. And it should oscillate, so it is never coming from just one direction. This air movement allows the seedlings to develop strength, so they are not so floppy during transplanting. 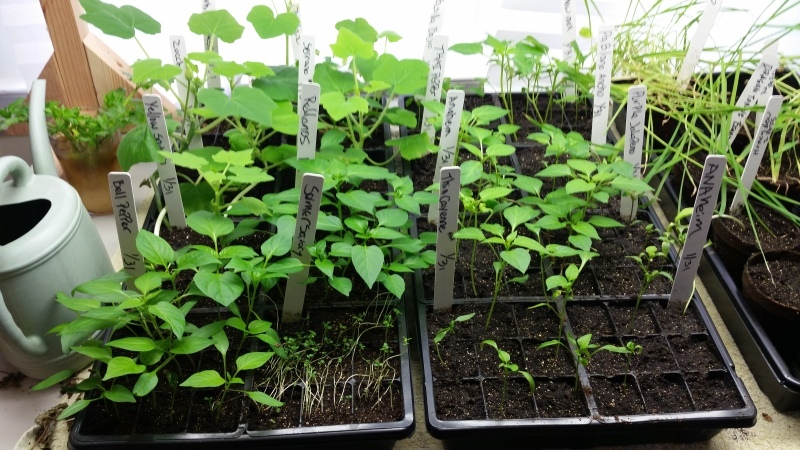 Next, greenhouse seedlings are delicate, and suffer transplant shock if they are just stuck outside. To combat this they need to be, “hardened off”, by gradually introducing them to the great outdoors. To do this requires about 7-10 days of gradually increasing exposure, in the shade for the first 3 days, and in the sun for the next 3, and finally late or early in the day leading to an overnight stay. There are other methods to harden off plants too. But without this “training”, a poor seedling raised in a sheltered environment has little chance of survival. All my pepper plants died. My squash plants were hit pretty hard, but they look like they may pull through. But there is a lot of good news! 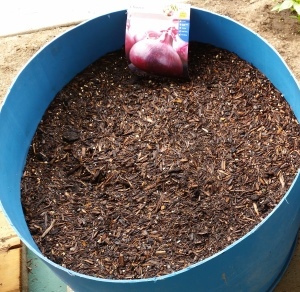 First, I cut a plastic 55 gallon drum in half to use as planters for my onions. I got these drums for $11 each, used. They were used to transport soy sauce before I got to them. A little soap and water and all the soy sauce residue was removed. I added holes in the bottom for drainage, and placed them on bricks next to my bags of potatoes. I filled them with Mel’s Mix. I had also filled my “Quick and Dirty Deck Planter” with Mel’s Mix, and planted a third of it with carrots, and two thirds of it with spinach. The idea is to have fresh spinach all summer. 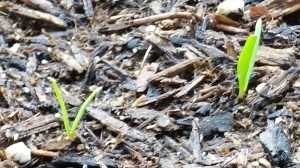 The spinach sprouted very quickly. Since late January, I’ve been busy doing some pretty major work around the yard. The goal is to always try to plant food. I don’t always do this – we have succulents and pots of flowers on the porch to the East of the house. I’ve planted lavender in the ground to the East too. The house came with two orange trees. The orange tree in the back yard was a nuisance, so I removed it completely. The orange tree in the front yard produced a LOT of oranges this year! About 300 pounds of oranges. The house also came with a mystery tree in the front yard. Here are some images of it. I’ve done a little asking around and have discovered that the tree is a Glossy Leaf Privet, aka a Ligustrum lucidum. I was hoping for an Elderberry, but unfortunately the berries on this tree are not edible. They can be toxic. The tree is somewhat invasive, and it tries to propagate by sending out shoots everywhere. I’ve been keeping the shoots in check with my lawnmower. So now I’m considering tearing out that tree and planting something I can eat there instead. It’s too early now to decide – I won’t be able to order a decent fruit or nut replacement for it until late fall. I’ve taken the time to update the layout of my house, and what is being grown where. The blue spots around the house are potted plants. 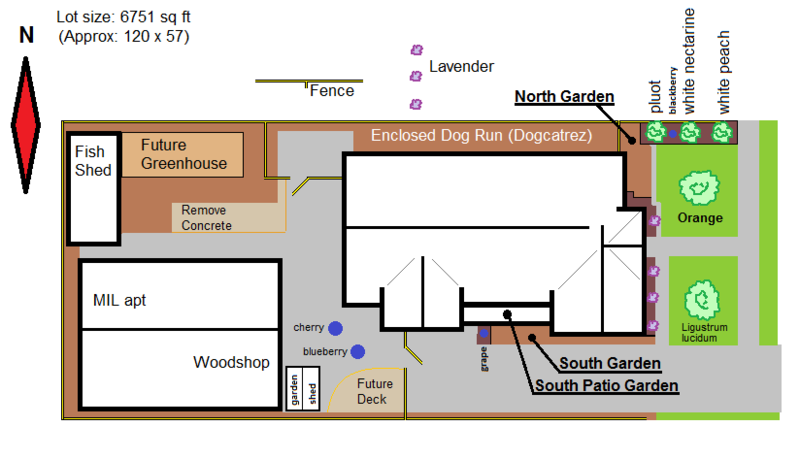 You can see the cherry tree and blueberry bush in the back yard near the future deck. You can also see the placement of my garden shed here. I’ve named my North and South gardens, and the South patio garden. I also started work to mulch in areas of the yard that I didn’t want to plant in. The most work went into the North Garden, and into the mulching of the fruit orchard to the North East of the North Garden. Before I mulched in that area, I had to move the irrigation pipes and add a border. You can see an album of me doing that here. The North garden also requires soil amendment, as did the South Garden. 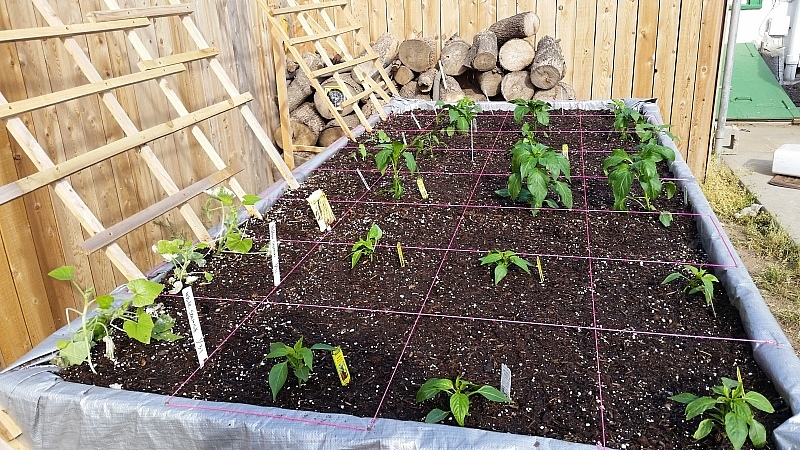 I’ve already weeded and amended the South Garden, and planted my first pepper plants there. Weeding was pretty bad since I’d let the Bermuda grass take over there. Removing that was back-breaking! More on this in my next update. 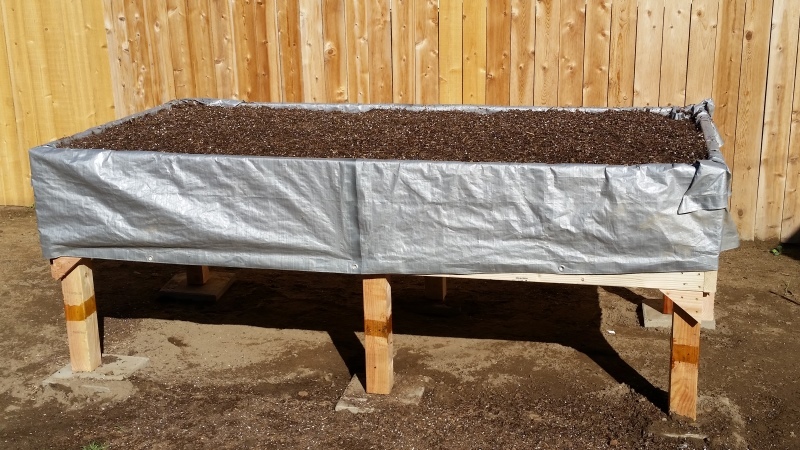 First, I’ve finished the raised grow bed in the backyard, and filled it with “Mel’s Mix” from the :Square Foot Gardening recipe. Next up for this platform garden is the addition of a trellis system. 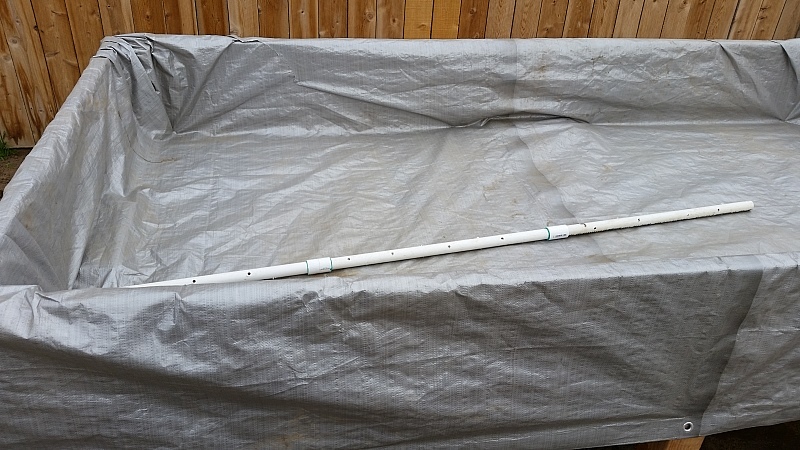 I plan to grow beans and squash in this thing, and I don’t want the Argentine ants to get them, so any part of the trellis that touches the ground will have a barrier of Tanglefoot on it. The idea is to keep all fruits and veggies OFF of the ground, and have the only pathways to the garden blocked from the ants. I may even sprinkle diatomaceous earth around the bottom of the thing. I’m busy weeding the garden to the South of my house. (I’ll call it ‘The South Garden’ from now on – to make it sound bigger!) 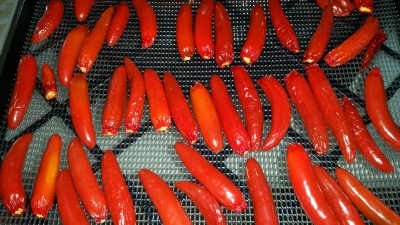 I’m doing this in preparation of planting lots of different kinds of peppers there. 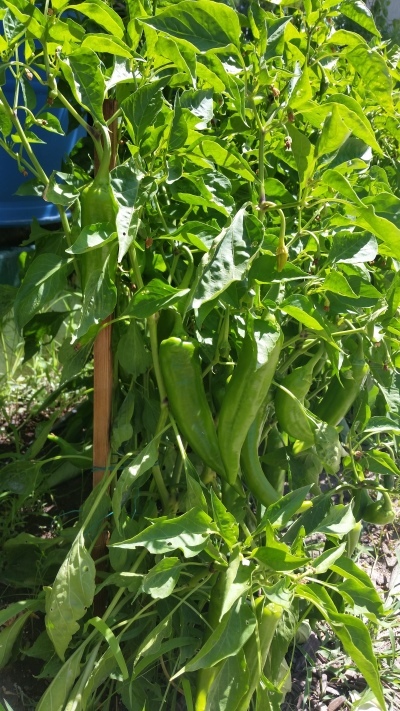 Last season, pepper plants were a huge hit. 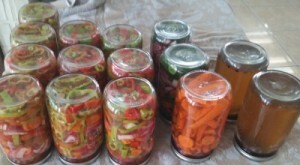 They grew well, pests left them alone, and our canned peppers were so delicious that we ran out before Christmas! Totally not fair! 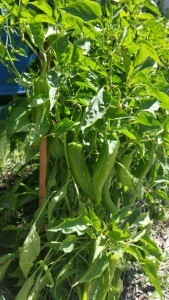 This year we intend to grow lots of meaty peppers for canning, and spicy peppers for spice. As I was digging out the South Garden, I kept looking at all this wasted space on my porch. We have a wrap-around porch, and the South side of it gets very hot in the summer. 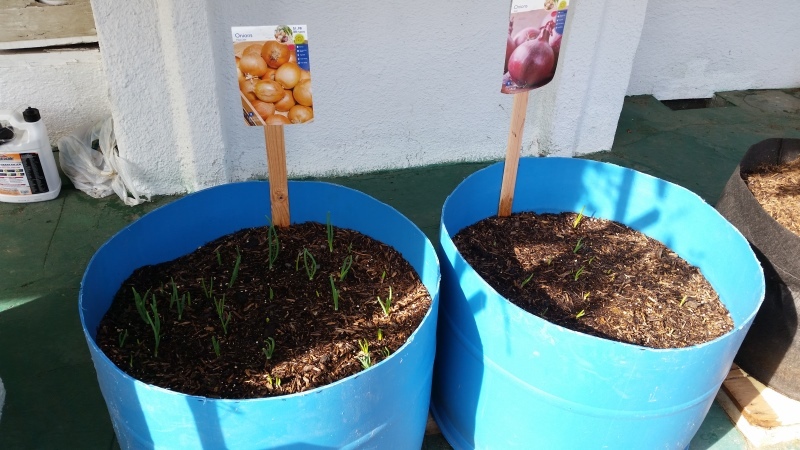 I’ve been wanting to plant cover in pots or planters there to catch the sunlight, and reduce the heat transferred via the concrete into our house. 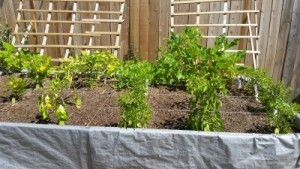 Potato grow bags are a good way of forcing potatoes to continue adding new potatoes to the plant. If you’ve never used these before, here’s a site with a good explanation of them. 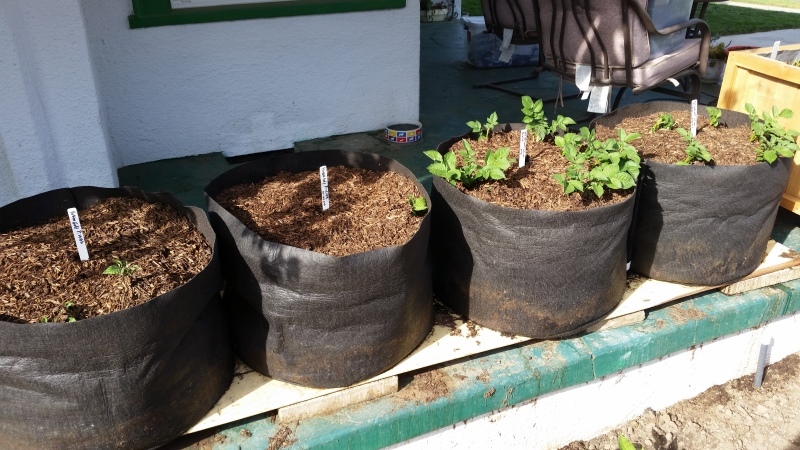 The two bags on the left in this image are seeded with Yukon Gold, and the two bags to the right are seeded with red potatoes. You will notice that I’m not letting the bags rest directly on my concrete patio. They are on boards that are resting on bricks. This is to prevent moisture from accumulating under the bags and damaging my porch. I do expect an ant invasion on these poor guys, and will have to keep an eye on them. I’ll use diatomaceous earth here, and may try to tanglefoot the area – but possibly not… that would be a lot of tanglefoot! I will be putting a critter net over the top of the potatoes because I have a very common, but beloved garden pest that might attack these things. My cats. They see these bags as “fun sized” litter boxes! After I finished putting these on my porch, I realized that there was still another 3 feet of room to the left of these bags. 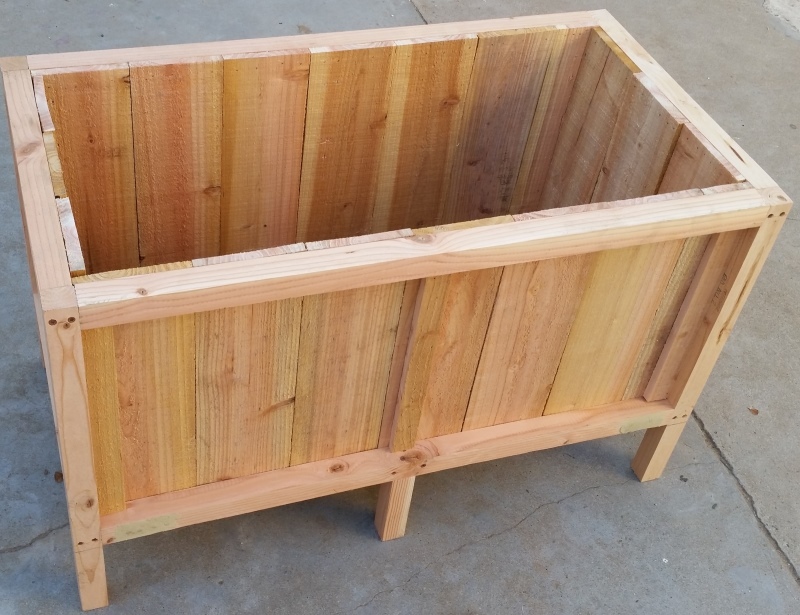 So I built a wooden planter. 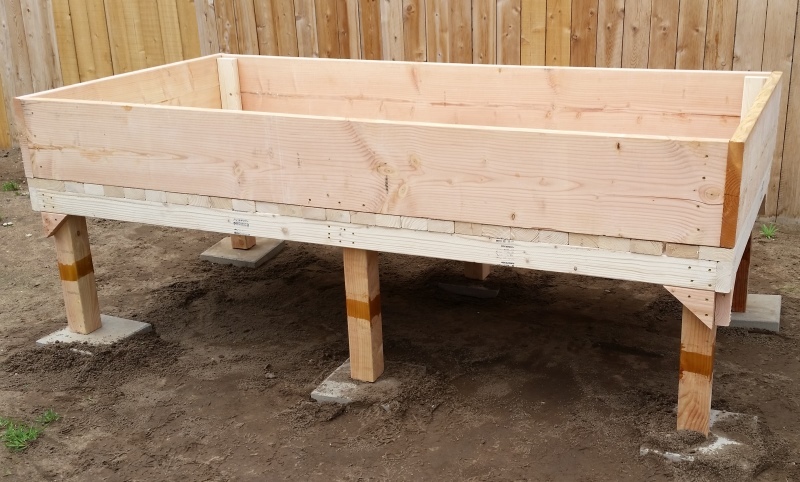 This is what I’m calling a “Quick and Dirty Deck Planter”, and I’ve created a set of plans on how I made this thing. You can download a PDF of these plans by clicking on the image, or on this link. They’re free – have fun! It’s “quick and dirty” because it took me about an hour and a half to build it from raw materials in my woodshop. I also only expect it to last 3 or 4 seasons before it starts to succumb to self-composting. (That means it will rot slowly). 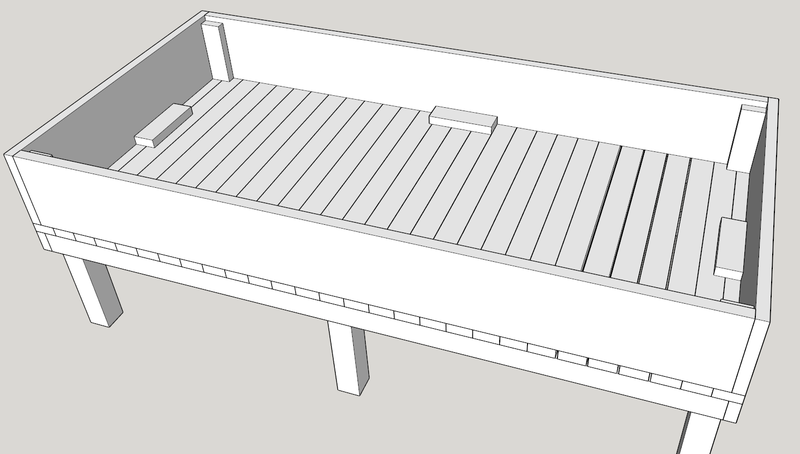 I’ve got plans to make a better, more robust model of this, and use it in several places around my porch. When I do, I’ll post the updated plans. One really nice thing about this planter is that it is raised 6-inches off the surface of the porch, on 6 legs that are easily protected by Tanglefoot. I’ve already put this planter in it’s location, and put tanglefoot on its legs. Soon I’ll fill it with Mel’s Mix, and having it grow some tasty spinach. Since spinach can be harvested without killing the plant, I plan to have fresh spinach in my salads and sandwiches all summer!